Known in Japan as Gigantic Drive, Enix's 2002 release of Robot Alchemic Drive for the PlayStation 2 was one of the very few games that I ever picked up based purely on a playable demo. Had it not been for that fateful Official U.S. PlayStation Magazine demo disc (October 2002, Issue 61), I likely would never have discovered this gem. 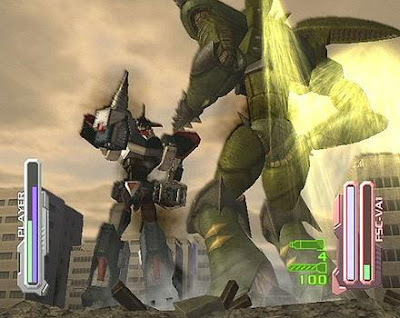 Inspired by developer Sandlot's love of classic Super Robot anime like Gigantor (aka Tetsujin 28), the game put the player in control of giant robots defending the city from giant alien monsters. For Americans unfamiliar with the Super Robot genre, the campy form was much closer to Godzilla or Ultraman than to Gundam. The game began with a mysterious and hostile alien race known as the Volgara arriving in the city and proceeding to blow stuff up. It was then up to the story's teenage protagonist, the recent head of the ailing Tsukioka Industries and interim chairman of the Civilization Preservation Foundation, now thrust into the role of humanity's last hope, to reluctantly take command of the foundation's secret weapon, the giant remote-controlled Meganite robot, whose development costs likely drove Tsukioka into ruin. 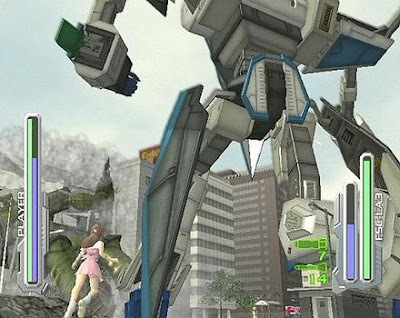 The big gameplay twist was that, rather than playing as the giant robot, the player played as the guy who controlled that robot via a remote that looked remarkably similar to the PS2 controller. Starting out in third person, the chairman would navigate freely around the city, using the equipped Gravity Booster to fly to a suitable vantage point. Then, switching to a fixed first-person angle based on the character's position, the player would operate the robot remotely. As the action moved around and out of the chairman's-eye view, or, in some cases, as the vulnerable chairman's position became too perilous, it would be necessary to shift back to third-person mode, moving nearer or farther to a better or safer angle. Those seeking danger (or motion sickness) could even place the chairman on top of the Meganite's shoulder, though it was unstable at best, vomit-inducing and completely suicidal at worst. Camera has posed problems for practically every developer that has ever tackled a 3-D game, but R.A.D. 's uniquely-inspired approach took a potential weakness and turned it into the game's greatest strength. Once in first person, the inventive Meganite controls further distinguished the gameplay. The robot could only be made to walk one step at a time, with L1 and R1 corresponding to the robot's left foot and right foot. Likewise, the two analog sticks governed the Meganite's two arms. Pressing both L shoulders or both R shoulders caused the robot to pivot, L2+R2 was crouch, and the face buttons were used for special functions, such as firing projectiles or transforming into the secondary mode. The piece-by-piece micro-control took some getting used to, but, once grasped, it was actually one of the most tactile control schemes ever conceived. While the game included an easy mode with more traditional controls, using it robbed the experience of a large part of its enjoyment. It all sounds convoluted, yes, but that was the beauty of it. The game so convincingly immersed the player in the madness of the Super Robot world that I fully expected the most diabolical mad scientist control mechanism imaginable, and, then, as I gradually got the hang of it, the satisfaction was immeasurable, until I started to convince myself that I had to be the only one capable of handling this sophisticated machinery, the only one capable of saving the city from these accursed space monsters. Starting out, the player could select one of three different identities for the chairman, including two males: the wide-eyed Naoto or the aloof Ryo. For those preferring a female protagonist, there was the ditzy Yui. I chose Ryo for my playthrough, but the choice had little effect on the plot and none on the gameplay. The only notable change, I'm told, was regarding the romance subplots. The love interests did not change gender to accommodate the selection of a female protagonist, so Yui's relationships with them became merely deep friendships. More significantly, the player had to choose from three Meganites: the Vertical Fortress Vavel, the Airborne Dominator Laguiole, and Gllang the Castlekeep. Laguiole and Gllang could transform into a jet and tank, respectively, while Vavel was the balanced, traditional mech, equipped with the high-risk Volcanic Mode, which would max out its destructive power for a short time, after which it would crash from the strain on its generators. Through the course of the campaign, the chairman would take control of all three, but the initial selection would remain the primary Meganite. Mimicking the format of a television anime, the story was split up into about fifty short episodes. Most of them revolved around a fight against a single Volgara, and, while a lack of enemy variety made for some repetitiveness, the mission structure and objectives would occasionally change to keep things from becoming too formulaic. The Volgara might attack different parts of the city, for example, while the Meganite usually had to start from the same location. The civilian population of the city added other variables, as the player would sometimes be tasked with actually protecting the people, instead of just pounding on the enemy and invariably causing immense collateral damage. The game was alarmingly arbitrary as to when civilian lives mattered, however, as the same bus that had to be saved in one mission could be crushed ten times over in every other. Some episodes actually contained no action and instead focused on progressing the narrative via the dialogue, which showcased the comically horrendous English voice acting. Hilarious precisely because it didn't appear to be in any way an intentional parody, it nonetheless added an ironic authenticity to the experience, as it hearkened back to a tradition of bad English dubbing in anime. The worst offender may have been the actor for my protagonist, Ryo Tsukioka, whose delivery seemed consistently and inappropriately without affect. My favorite character, however, was Dr. Herman Wiltz, the hero's primary adviser and also the developer of the Alchemic Drive, which powered the Meganites. His thick German accent was absurdly over-the-top, but the performance exhibited such enthusiasm that seemed to almost reflect genuine belief in the insane material being read. By the time the story was over, I too believed it and no longer perceived a performance, instead fully recognizing the uniquely memorable voice as that of Dr. Wiltz himself. Sadly, for those hoping for a straight take, the North American release did not include the option to use the Japanese language track. Coming out three years before Shadow of the Colossus, R.A.D. emphasized scale as no video game ever had, with the Meganites and Volgara impressively towering over the city's buildings. Providing an appropriate sandbox for these titans was the highly destructible environment, where nearly any structure could be knocked down. Indeed, as mentioned, collateral damage was unavoidable, given how hard these things punched and how much harder they fell. I often even inadvertently destroyed the Civilization Preservation Foundation building, though it would be rebuilt after every mission at great expense to the chairman's backers. As for the citizens, instead of simply evacuating the city after the first three or so Volgara attacks, they added to the potential carnage, as geysers of blood would erupt every time some panicked crowd foolishly fled into the shadows of my Meganite's steps. Adding to the three perspectives offered by the differing protagonists, there were also multiple endings based on how the player fared with each of the two potential love interests. The chairman's classmate, Nanao, was a hard-luck case, who struggled to make ends meet on her own, after a Volgara blew up her grandmother during the game's opening act. Winning her over involved little more than keeping her home and workplaces from being destroyed incidentally during missions. Needless to say, I failed miserably in this regard. The other romantic subplot involved Ellen Bulnose, the chairman's well-endowed former betrothed/best friend, back when Tsukioka and Bulnose planned to merge, now engaged to Masaru Misaki, who, as the heir to Japan's new leading arms manufacturer, also provided most of the protagonist's funding. In rather twisted fashion, the path to Ellen encouraged the player to continually destroy Misaki's buildings in order to terminate their engagement. In addition to the single-player campaign, the game also included a splitscreen versus mode, where two players could battle using the Meganites or any unlocked Volgara. The obscurity of the title, however, made it hard to find suitable opponents. Actually, R.A.D. was neither the first nor the last remote-controlled giant robot game developed by Sandlot, whose catalog is mostly comprised of games in this genre they created. It is, unfortunately, the only one to have ever been released outside Japan. That truly is a shame, as R.A.D. stands as evidence to the developer's brilliance. The unique perspective and controls made for the most immersive video game experience I ever had. It easily ranks within my top five games of all time. Next time, a very special installment! How special could it be? Perhaps a sixth game will grace your top 5? Hey, we should play two-man in this game.